The curriculum for University Honors has been revised, effective for students entering The University of Iowa Summer 2013 and after. 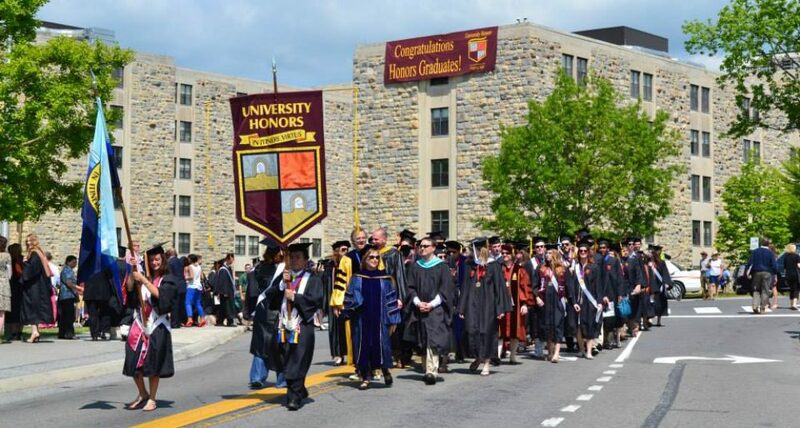 Students who complete the new University Honors requirements will have a notation on their transcript and diploma stating that they have graduated with University Honors. Indication of this award will be part of graduation ceremonies. Students must opt into the program after being invited to do so. First-year first-semester students must attend an Honors Program orientation session in the summer; other students must attend an informational session (e.g. Welcome to Honors) during a regular semester. All students in their first semester of Honors Program membership must take at least one Honors course. First-year first-semester students must complete a 1 s.h. Honors First-Year Seminar during the fall semester. Other students may choose any offered Honors course or may develop an Honors Contract course. Students must maintain a cumulative UI GPA of 3.33. Students must complete a minimum of 12 s.h. of Honors course work by the end of the fourth semester of fulltime Honors Program membership. A maximum of 3 s.h. of Honors Contract courses may be applied to the level one requirement except in the case of new members with significant General Education credit. These students may apply up to 6 s.h. of honors contract credit. Students must complete an additional 12 s.h. (or the equivalent) of Honors experiences. Experiential learning for honors credit can take many forms, including research, study abroad, or internships; work completed for honors in the major, usually resulting in a thesis or creative project, also counts as experiential learning for honors credit. Honors in the major (as required by a department) completely satisfies the level two requirement. Mentored research (practica, paid, or as a fellow with the Iowa Center for Research by Undergraduates). Internships with project* (may satisfy up to 6 s.h. of the level two requirement). Honors and graduate level course work (may satisfy up to 6 s.h. of the level two requirement). *Study abroad and internships require a pre-approved, independent project with a poster presentation or paper facilitated by Honors. For questions on the new curriculum and requirements, contact Holly Yoder at honors-advisor@uiowa.edu.